Ok, here is what we know. . .there is a coastal storm forming off the Southeast US coast tonight. This storm will strengthen and move north tomorrow, but 50-75 miles among friends makes a big difference in what we will see from DC to Boston. I am encouraged by the trajectory of this storm when compared to Sandy. This storm will more or less parallel the coastline heading north-northeast, while Sandy moved west-northwest towards land. This gives you a completely different outcome! Yes, there will be wind. Yes, there will be rain and possibly some snow. Yes, there will be some coastal flooding and high waves, but with a wind out of the north-northeast, that might be a saving grace. The NJ shoreline is already in shambles, so any storm surge and wave action is unwelcome, but it will not be as bad! Regardless, it is my assumption that no one will be riding this storm out on the barrier islands, but there may be some water rise in the back bays, etc. I have the breakdown below. 18z NAM model sea-level pressure and 6 hour precipitation accumulation valid at 7pm EDT Wednesday. 12z GFS sea-level pressure and 6 hour precipitation accumulation valid at 7 pm EDT Wednesday. HPC surface forecast for 7 pm EDT Wednesday. The 18z NAM and 12z GFS from today show a more westward trend from yesterday in the position of the surface low, but at this point, it’s a matter of semantics. The surface map issued by HPC is in fair agreement with these two model solutions and would indicate an area of heavy rain possibly mixing with or changing to snow from about Baltimore up to Philadelphia and into New York City by Wednesday night. Winds along the coast will be quite gusty, but may not reach appreciably far inland. Wind gust forecast valid at 7 pm EDT Wednesday courtesy of the NWS office in Mt. Holly, NJ. The wind forecast from the Mt. Holly, NJ National Weather Service (NWS) office shows a concern for wind gusts along the coast that exceed 50-55 mph tomorrow evening. With a surface pressure around 985 mb and a decent high pressure system to the north and west of ~1024 mb, the gradient will be tight. This wind along the NJ coast should be more north-northeast, not east which would suggest less of a storm surge. Speaking of storm surge, it looks like an average of 3-4 feet, which would be moderate flooding potential. If you are near the ocean or bay, please take this seriously, but again, it should not even come close to Sandy. At the same time, the water may be slow to recede between high tides on Wednesday, so any flooding will be bad flooding with the current state of the area. 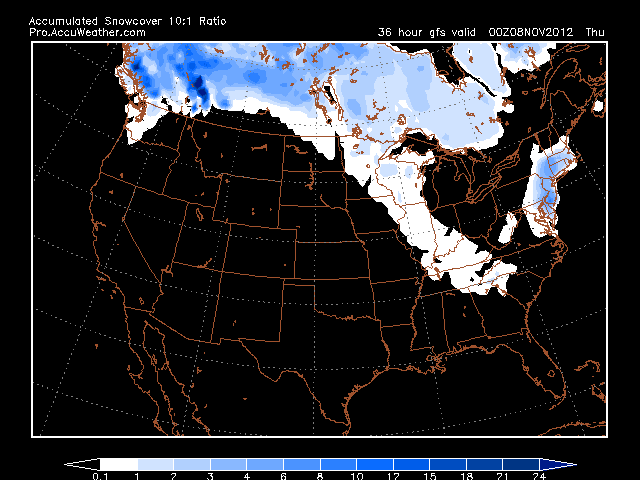 12 GFS snowfall accumulation valid at 7 pm EDT Wednesday. The final two maps above show the Day 1-2 precipitation accumulation issued by HPC today. Notice how the majority of heavy rain stays offshore, but coastal areas could pick up 1-2 inches, with part of southeast New England getting closer to 2-2.5 inches. Now, if you took the 12z GFS at face value, we could be talking 4-6 inches of snow from Wilmington, DE through Philadelphia. I’m not ready to commit to those numbers, but I think the DC-Baltimore area could get 1-2 inches of snow at most, but the confidence in this is low. Meanwhile, parts of NJ could get into a band of 2-4 inches as the storm reaches its peak. Again, confidence is low, but don’t be surprised if you have a very early snowfall for this area! The rest of the country is quiet by comparison, but don’t worry, a big, big change is on the way. How about temperatures in the 60s or 70s in a week for many? Yeah, I like that too! Thanks for reading! Thanks Mike, I like reading your blog because I “get” it even though I don’t really know weather! I’ll be happier to read about when snow will be here in Missouri though!